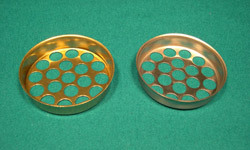 Choose from a variety of Poker Table Accessories, all available for immediate shipment. 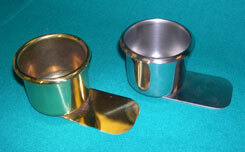 We carry poker table cloth, metal and plastic drink holders, poker drop slides, ash trays, dealer buttons, and more. For our FREE 104 Page Casino & Game Room Supplies Catalog, please contact us at 1-800-233-0828. 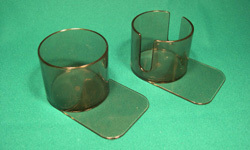 These blade style drink holders are made of durable acrylic. 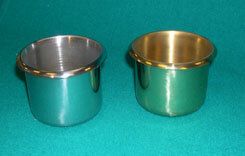 You can choose from regular, "mug-fit" (each mug-fit holder has a cut-out for a mug handle), or Large Size (3-3/8"). 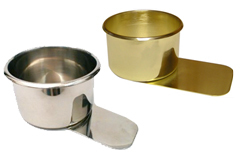 Regular Drink Holder Sale Price: $1.75. Was $3.95. Save 56%! 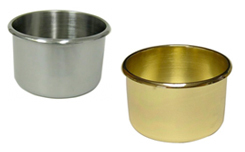 Mug-Fit Drink Holder Sale Price: $1.43. Was $3.95. Save 64%! Brass Sale Price: $6.25. Was $11.25. Save 44%! Browse our wide selection of Poker Items including our Poker Chips, Poker Books, or our Poker Playing Cards.